Climate and Agriculture in the Southeast | What does the current La Niña mean for spring frost? What does the current La Niña mean for spring frost? I read a story this morning in Growing Georgia reminding producers that the deadline for purchasing crop insurance for fruit is coming on November 20. I thought I would take a minute to discuss what the current weak La Niña means for spring frost. In general, neither El Niño nor La Niña are particularly indicative of late frost in the spring. However, this year’s event is weak and La Niña may be functionally over by spring. Neutral years are more likely to have late frosts than either of the ENSO phases. 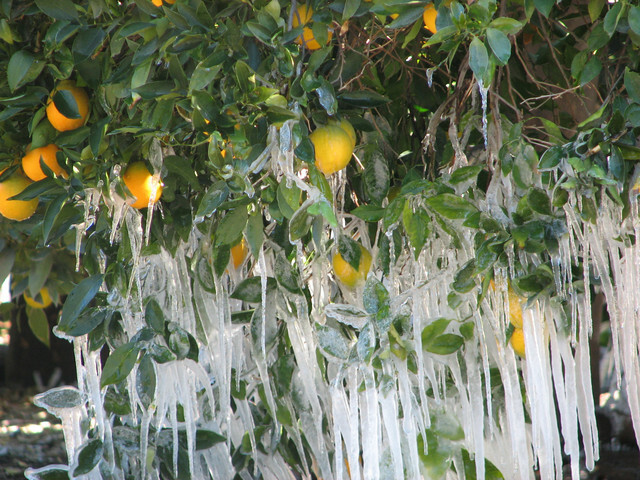 While I am not an expert on crop insurance, it does seem to me that this might be a particularly good year to consider getting insurance for fruit crops. Another concern I have is that with the weak polar vortex (the coldest air is currently over Siberia but that is likely to change over the winter), we are going to see more variability in the weather this winter. That could lead to an early warm-up followed by more cold and potentially freezing weather. The dry conditions we are experiencing now also make daily swings in temperature more extreme, and frost in the morning more likely. 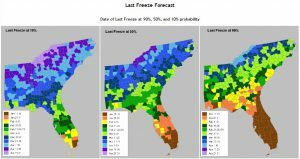 I was also intrigued by a recent scholarly article I read at http://iopscience.iop.org/article/10.1088/1748-9326/6/2/024015/meta which describes a trend in the Southeast towards later last hard frost dates. I haven’t had time to look at this trend carefully, but if accurate it would also indicate that insurance might be something for fruit producers to continue. 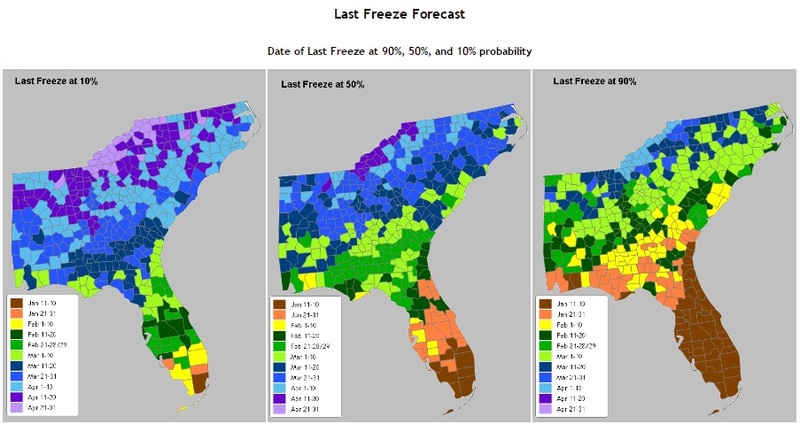 The last frost probability maps below (see http://agroclimate.org/tools/Freeze-Risk-Probabilities/ for a clearer view) show the dates for 10%, 50% and 90% for last frost. Posted in Climate science, Fruit. Bookmark the permalink.